Inside: Grab your free sub plans. These are great substitute teacher activities that will make your sub planning much easier. Sub plans. They are the bane of teacher’s existence! Okay, so that may be a little dramatic, but I don’t think it’s something any teacher can say they enjoy. I mean, think about it! What other job do you have to do MORE work to call sick than to just go into work and suffer through the day? Planning for a substitute is no joke! It’s no wonder that teachers don’t always take their days off when needed- which is why it is important that every teacher has emergency sub plans! As I explain in the post I just linked to, it’s VERY important that teachers use those sick days when needed. Whether it’s for a sick day, your mental health, a sick child, or anything else- it’s important for you to be able to take that time off when needed! Having emergency sub plans on hand makes it much easier and less stressful to make the call. Getting started from scratch with a sub tub can be daunting! What should you include? How should I put it together? There are so many questions. And there’s already so much to do, so it’s one of those things that often gets pushed down our to do list. Ever wish someone could just do them for you? Well, I’ve got some free sub plans that are print-and-go that will help you get started with setting up a sub tub, so you have some lessons already done for you. You’ll be one step ahead next time you need to plan for a sub day! Grab your Free Sub Plans! 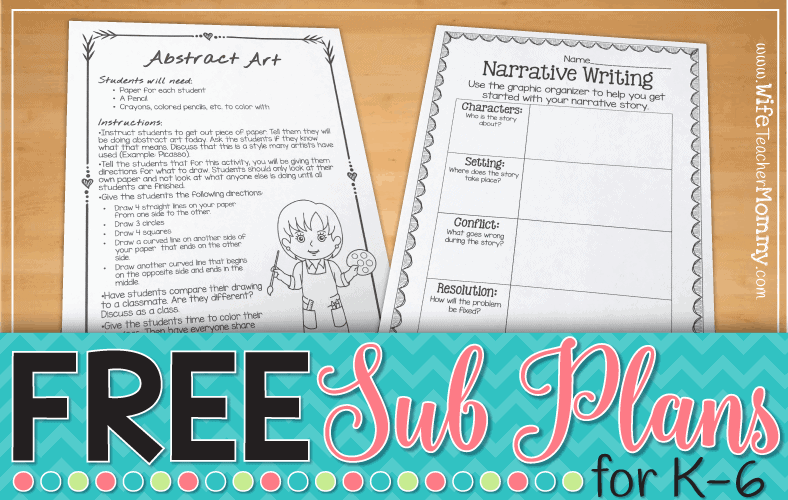 These free sub plans can be found in my free resource library. This resource library is exclusive, so that means that you have to sign up! (But remember, it’s free!) The free resource library includes lesson plans for Kindergarten-6th grade, some editable info forms for your sub, and much more! Click on the button below to sign up and grab your free sub plans. When you sign up, you’ll also get a FREE email course about how to put together your sub tub- with lots of tips for what to include, organization and more! This is in addition to all of the resources in the resource library, now and to come in the future! I’m constantly adding new resources to it. (I aim to add one every month). What are you waiting for? Click the button above to get started with your FREE sub plans now! And be sure to check out our blog post about the 5 big things your emergency sub plans must include. Hello, I’m a brand new substitute for k-8 anything would help! Thanks so much. Awesome! Be sure to enter your email to grab it.